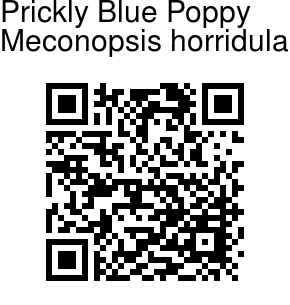 Prickly Blue Poppy is the most bristly-haired species of all the Meconopsis species. Flowers are usually borne in a spike-like cluster of many light-blue to claret-colored, or occasionally white flowers, with narrow leaves with bristly spiny blades. Petals are 4-8, obovate to rounded, minutely toothed at the tip, 2-4 cm long. Leaves are up to 30 cm long, elliptic to linear, narrowed into the leaf-stalk, usually entire, covered with yellow to purple bristly spines with darker bases. Capsule is ellipsoide to spherical, 2.5-3 cm, covered with reflexed, spreading or prostrate bristly spines. Flowers are often borne on leafless stems arising straight from the root. 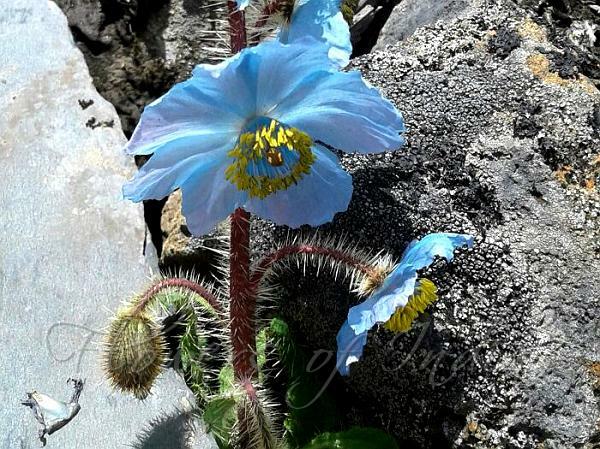 Prickly Blue Poppy is found in eastern Himalayas, from W Nepal to SW China, at altitudes of 3500-5500 m. Flowering: July-August. Photographed in Arunachal Pradesh & Sikkim.